I am not a lover of Music Concréte or indeed music solely based on field recordings. 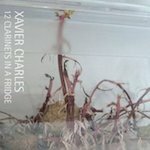 In this case you can skip the field part, as Charles has wandered no further than his kitchen and created sound sources within that environment; namely his fridge, as the title suggests. In fairness, he has also used his clarinet, and although I sound a bit harsh, he has been creating ambient music for some time, so in theory this shouldn’t have been run of the mill twaddle; and at a small insignificant level, some of this works. However, I cannot get over envisaging a picture of Xavier in a pinafore, ignoring the washing up and farting around pointlessly whilst his significant other wonders if he will ever get round to cooking dinner for once, rather than pretending to be a musician. This is as pointless a concept as many other releases from this genre and would most likely sound better if the clarinets had been firmly shoved up his backside; if anything it would have been as relevant.